OMG! That red is awesome! Wow, I *love* that collar-especially the knotwork. Is it already sold? oh wow, i love the red and the green. 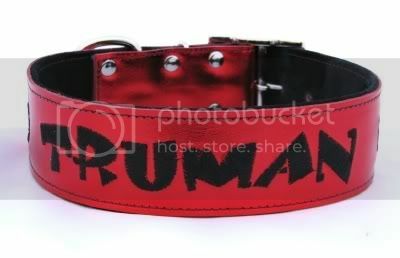 i want a collar for tucker, now that i am out of the woods on his possible hip surgery thing! i might need to place an order when i get some bills paid! The stitched patterns are an awesome idea!! 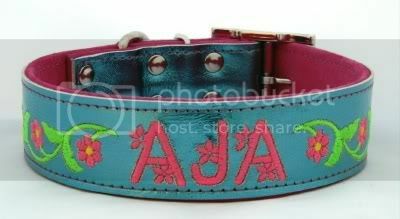 I mean, I'm not into the idea of putting my dog's name on a collar... but the designs are an idea I could see myself going for! They're so unique looking! ehhh Lisa??? Can you make something with some glittery/goldish embroidery? I can try...metallic threads are hard on mymachine and they tend to break easily..so it depends on which leather you have in mind..
Oooo! I can't wait to see what the burgundy metallic looks like!